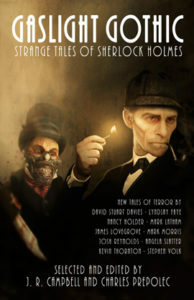 The fabulous Sci-Fi and Fantasy Reviewer has reviewed Gaslight Gothic: Strange Tales of Sherlock Holmes, edited by J.R. Campbell & Charles Prepolec, published by EDGE Science Fiction and Fantasy Publishing. I’m especially delighted as he says lovely things about my story, “A Matter of Light”, in which Kit Caswell from Ripper meets Mr Holmes. A Matter of Light by Angela Slatter is another interesting story in the anthology, and is perhaps the one that gave me the most to think about in terms of Holmes and Watson as characters. Featuring another occult detective, the character Kit Caswell (who I understand has featured in other works by the author), it’s a brilliant and multi-faceted story that really deserves multiple readings to fully comprehend everything to be found in its relatively short word-count. On the first reading, it’s a clever and inventive murder-mystery that makes use of social taboos that Conan Doyle would not have dared stray into in his canon writings, albeit with an overt occult angle at the end. But further readings highlight the difficulties that a female detective (occult or otherwise) would have encountered had they attempted to follow in Holmes’ footsteps; and in particular, Slatter uses this angle to throw light on some of the far less savoury aspects of Holmes as a character, particularly that much-lauded aspect of his ‘chivalry’ towards women which would obviously be seen in a much different light by the women themselves. This entry was posted in News and tagged angela slatter, Charles Prepolec, Gaslight Gothic, Josh Reynolds, Kevin P. Thornton, Lyndsay Faye, Mark A. Latham James Lovegrove, Mark Morris, Nancy Holder, review, sherlock holmes, stephen volk, Stuart Davies. Bookmark the permalink.